Audio is critical to the success of any event. Our custom designed sound systems cater for any venue across all segments of Live Events. NW Group has the latest video technology, from projection mapping, 4K Ultra HD, super widescreen and LED solutions. Lighting can transform your event. With professional design combined with our highly skilled lighting team your event will have maximum impact. We have flipped the venue model from supplier to partnerships where the NW Group model of full-service Technical Production using dedicated specialists is applied. NW Group has one objective: To deliver exceptional Technical Production by supplying the highest standard of Audio, Video and Lighting by specialist professionals across Australasia. NW Group is represented by Norwest and Haycom in Australia with Oceania and Spyglass our brands in New Zealand. Our mantra is full-service and we recognise that each brand are specialists across the disciplines of Audio, Video and Lighting. Each discipline is backed by an expert team, world-leading technology, unrivalled inventory and the highest safety standards. Our people all share our philosophy of impeccable client service and delivery. 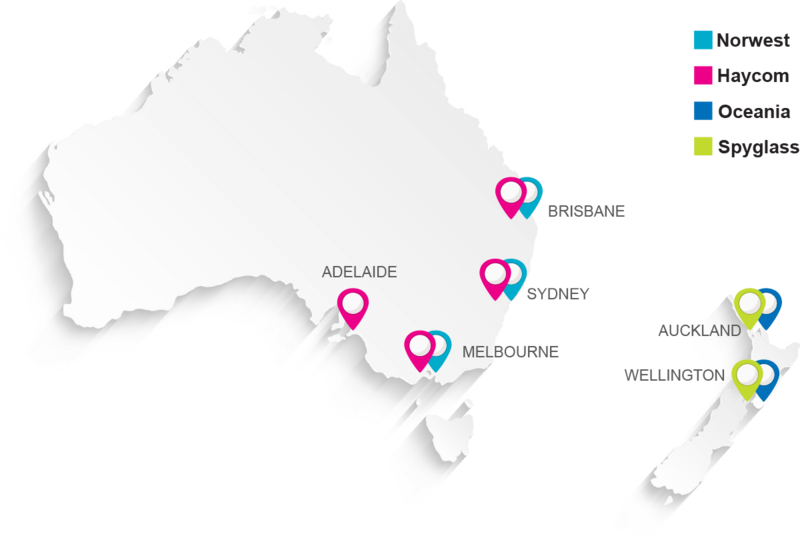 We have teams and equipment in Sydney, Melbourne, Brisbane, Adelaide, Perth, Auckland, and Wellington, and have the capability and resources to deliver your event anywhere. “Over a billion people around the world tuned in to watch the Opening & Closing Ceremonies for the Gold Coast 2018 Commonwealth Games in Australia, Norwest’s professionalism, dedication and delivery were integral to this success. Thank you for helping us tell a universal, unifying story from this awesomely beautiful place, our energetic country, with our ancient, richly connected stories and our warm forward-looking people”.